This thread is for any discussion or questions related to the mission Ultimate Burglary by -Terra-. Nice mission ... all I need now is the Eye but IMHO I can't reach it without a rope arrow but I can't find any. EDIT: Nevermind, made it with a big jump onto the Hammer statue. BTW, I even climbed on the wooden roof beams, but there was nothing to grab up there. Looted 8346/9216 on plaing hard. Last edited by zappen; 2nd Dec 2018 at 17:20. Hey, I'm stuck on how to the eye, can you give any hints? I've found 4 switches so far: 1 in the Kitchen, 1 in the chapel, 1 in the upstairs bedroom, and 1 in the room you open with the key. @Psych0sis The fifth switch is not far from the room you opened with the key. that it would be extremely difficult to detail everything out while you're on contest deadline with a map of this scale. I understand that. Thanks for Playing, the goal for this Contest FM was to put the Difficult down and make it easy to play for everyone. 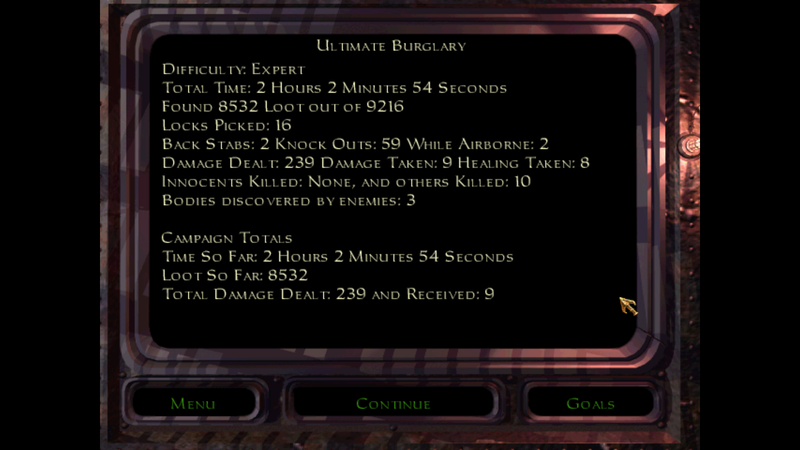 i remember the first Thief 1 OM Lord Bafford, it was not too hard and easy to solve, i was 12 when i started with Dromed and Thief. Just finished this one, and while I didn't dislike it, I didn't find it very enjoyable either. I think the premise is quite cute, and the use of textures is pretty tasteful. However, the gameplay isn't very interesting. Most of the interiors are comprised of long corridors with rooms that lead nowhere, and the guards are either turned away or patrol between two points. The city is a bit more interesting, but it is way too flat. No ramps, no stairs, no uneven ground at all. As a result, it becomes less engaging to traverse it with time. Last edited by marbleman; 4th Dec 2018 at 16:41. It's almost certainly a guard on the floor below. There's a few room brush issues throughout the mission. Ah, I see.... nowI only need to find the horn.....any clues? There should be one area of the map you haven't been to yet. You need to head to the far south west. Finished with 100 missing loot. Some parts I liked and some I didn't. Would've liked a rope arrow and more vertical exploration, though Ramirez plaza was better at this. The cathedral was by far the most interesting, and the castle with the horn was also quite enjoyable. Some bugs that should've been caught in testing. Baffords was very dull. Hints to other hidden pieces, perhaps? I too noticed that there were some room brushing issues especially at Bafford's front door. I found the silver nugget under the bridge but then I couldn't get out of the canal. I think with a little more time this mission could have been fleshed out more, although I did find the gameplay relaxing after playing some harder missions. One thing that I wish for: a final objective so that I can find all of the loot before the mission ends. I found this mission to be pretty enjoyable, although like others I did spot a couple of roombrushing issues. 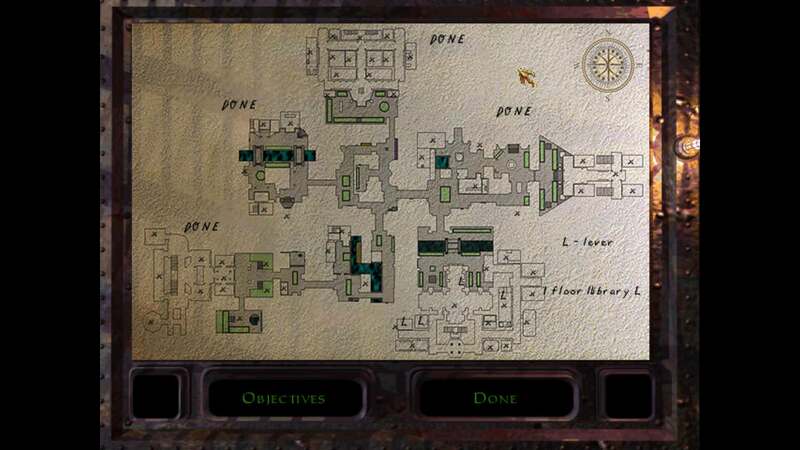 I also think some serious LOTP style gameplay along with some underground sewers/caves would really enhance the place even more! I am confused with the five switches in the hammer temple. But where is the 5th? I really enjoyed this mission. There have been some constructive criticisms but to me it felt very “classic Thief.” I liked the premise and although we have seen the five switch objective before, it was well done and quite nostalgic. Gameplay was fun and plenty of places to explore. A rope arrow would have been nice. In some ways, I thought that the premise of this mission was what every mission in the contest was going to be, a sort of "greatest hits" of TDP. From the description, I was expecting a huge amount of OM porting, but I was surprised to find that it was all original. The lack of a rope arrow was an odd choice, especially given the location of the Eye. I also think the story could have been developed beyond a few single paragraph readables.